Advance stop lines are a painted stripe in the roadway set back from the crosswalk, directing drivers to stop at least 4 feet before the crosswalk. 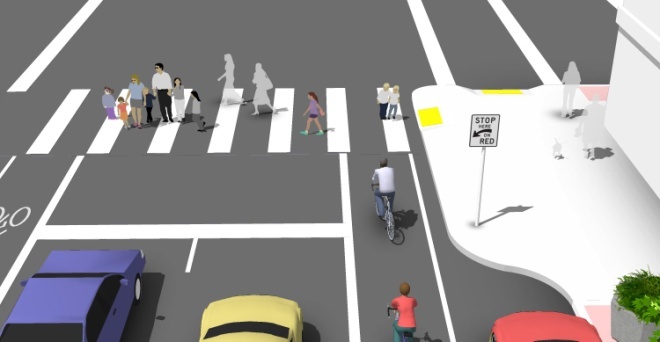 On multi-lane roads advance stop lines increase pedestrian visibility for drivers in other travel lanes, especially important around schools, as students are harder to see than adults. Advance stop lines also discourage encroachment upon the crosswalk at a red light, leaving more free space for pedestrians to cross. All way pedestrian crossing phase, also referred to as a scramble signal, is a signal phase where all vehicle movements are stopped, and all pedestrian movements are permitted. 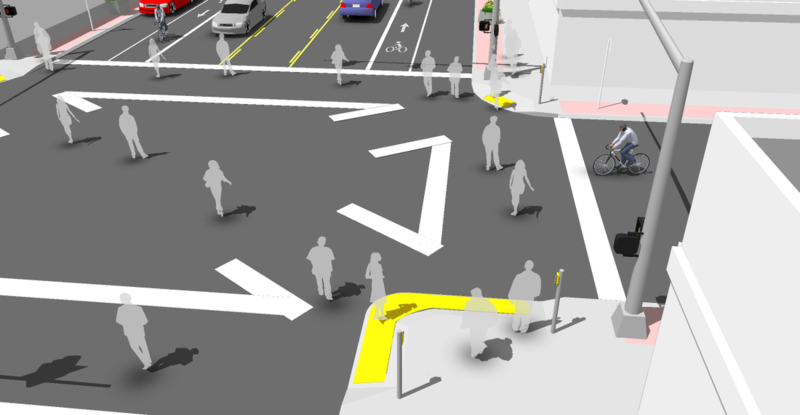 Pedestrians may travel along all crosswalk legs and potentially even in a diagonal movement across the intersection. Right turn on red should be prohibited during all way pedestrian crossing phases. This treatment is most appropriate in areas of high pedestrian crossing demand. In addition to the visual cues provided by signal heads, audible signals provide guidance for vision-impaired pedestrians. ­ Different audible signals should be used for different crossing directions to inform the pedestrian which intersection leg has a walk signal. Sounds should be activated by the pedestrian push-button. The Leading Pedestrian Interval (called “LPI”) gives pedestrians a walk signal a few seconds before motorists receive a green light, which makes pedestrians more visible to motoris­ts making right turns. 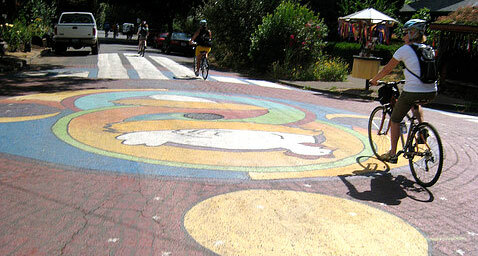 Painted intersections, sometimes called street murals or “Intersection Repair” are volunteer driven efforts to transform an intersection into a plaza like community space by painting artistic imagery on the street. Painted intersections generally require permission from the transportation department and majority support from the adjacent neighbors. 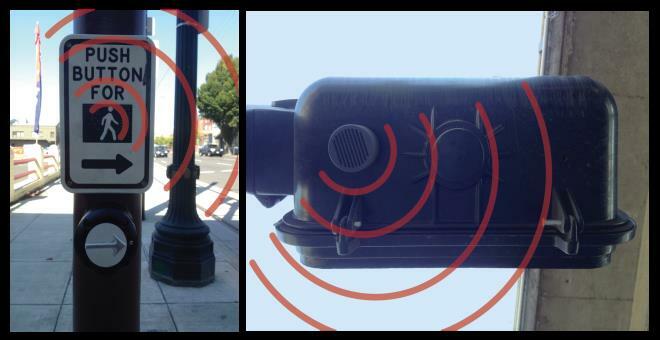 Pedestrian heads are the “walk/don’t walk” signal boxes instructing pedestrians at intersections. A walking person indicates that it is safe to cross the street, followed by a blinking red hand with a number counting down the seconds until the signal changes. 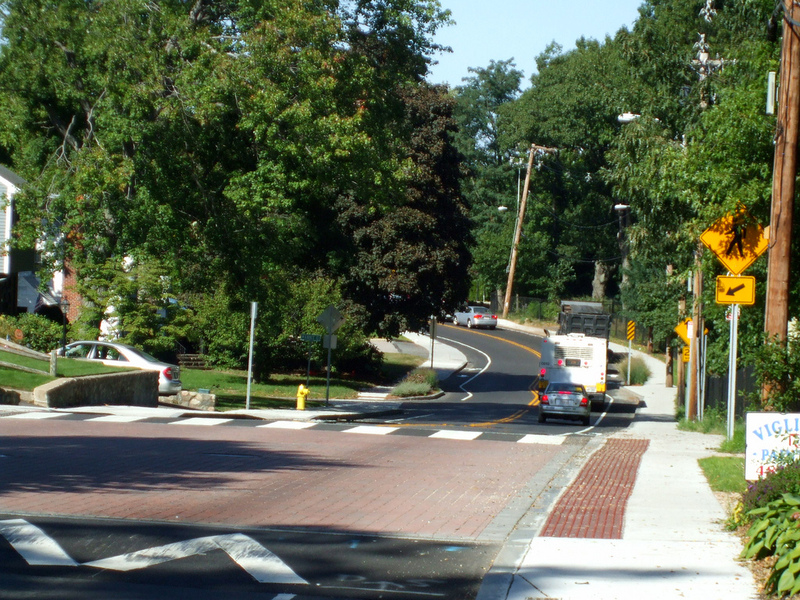 Raised intersections are a type of traffic calming and placemaking treatment where an entire intersection are is elevated to sidewalk height. This acts as a speed table, slowing approaching traffic in all directions. Pedestrian crossings are improved by remaining level with the sidewalk throughout the crosswalk. Special paving is often used in raised crosswalks to draw attention to the treatment and create a more plaza like atmosphere. Traffic lights must assume that pedestrians walk a certain speed to calculate the time needed to cross at a light, often 4 feet per second. However, children may require more time to cross an intersection than adults. Re-timing signals to 3.5 or even 2.8 feet per second at crossings used by large numbers of students and seniors can ensure that everyone has time to cross the intersection safely. A bicycle signal is an electrically powered traffic control device that should only be used in combination with an existing conventional or hybrid signal. 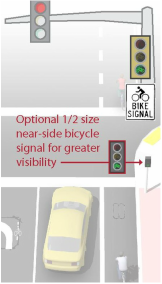 Bicycle signal heads may be installed at signalized intersections to indicate bicycle signal phases and other bicycle-specific timing strategies. Bicycle signals can be actuated with bicycle sensitive loop detectors, video detection, or push buttons. 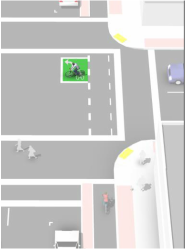 Two-stage turn queue boxes offer bicyclists a safe way to make left turns at multi-lane signalized intersections from a right side cycle track or bike lane. On right side cycle tracks, bicyclists are often unable to merge into traffic to turn left due to physical separation, making the provision of two-stage left turn boxes critical.